The Studio is located on Hwy 49 in Auburn in Fiddler Green Plaza. We have been at this location since 1989. Studio Hours are Tuesday-Friday 10:00a.m. -5:00p.m. Saturday and evenings are by appointment only. From the Intersection 1-80 & Hwy 49 (Grass Valley Hwy.) go approximately 1-l/2 miles north (towards Grass Valley) The Studio is on the left in Fiddler Green Plaza. From the intersection of Bell Rd. 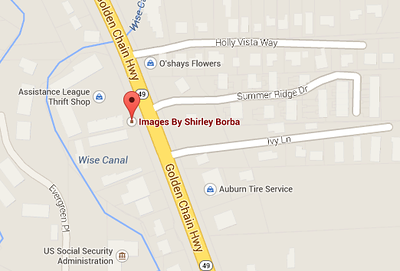 & Hwy 49 (Grass Valley Hwy.) go approximately l-1/2 miles south, The Studio is on the right in Fiddler Green Plaza.